“Visions Through A Glass, Darkly” by David I. Aboulafia begins with Richard Goodman driving through the countryside of New York State. As he looked out onto the landscape, he suddenly sees himself covered in blood, and remembers that he is supposed to die within four minutes, as foretold to him by a Coney Island psychic. Richard was a gifted child, although to him his gift was more like a nightmare. Not only could he foretell the future, he could also see the dead. As an adult, he worked as a caretaker in an institution that taught the craft of watch making to their disabled patients. One day Richard and his girlfriend went to Coney Island, and it was there a fortune-teller revealed to him that he would die in less than three days. She also told him that he was now the last ‘conjuh.’ But, what does that mean? The next day when he gets to work, he finds a room in a workshop destroyed, with dead animals lying around. As Richard begins to investigate, he realizes through his intuition and gift, that someone is bound to commit a horrible crime…it is someone he loves, but who? David I. Aboulafia presents to readers a well-written, dark horror story with impeccable and genuine dialogue, as well as spot-on character development. The only complaint I have is that the pace felt somewhat slow in the beginning. However, it does speed up after about the first 30 pages, and I am glad I kept reading! The author delivers an intriguing, thought provoking, dark thriller that will linger in the reader’s mind for a while. The storyline, filled with twists and quality writing, keeps the reader hooked and turning pages ‘till the end. 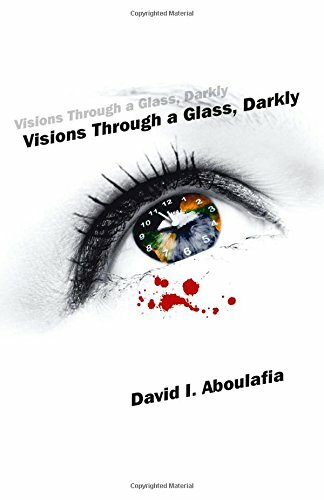 I found “Visions Through a Glass, Darkly” by David I. Aboulafia to be an intriguing and dark must-read story, and recommend it to all horror, and thriller lovers as a Five-Star book for sure.